To Keep Pace With Your Customers and Competitors, It’s Time to Leave Your Legacy Software Behind. Legacy enterprise resource planning (ERP) systems struggle to keep up with the modern pace of business, and they fail to meet the changing needs of your workforce. Can your leaders quickly find and analyze vital data? Are your employees’ tasks and processes straightforward and efficient? Does your ERP software make it easier to support growth? 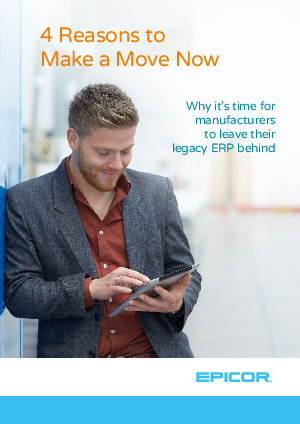 See how manufacturers upgrading to the latest ERP software from Epicor transform their business by delivering the visibility, efficiency, and productivity essential for sustained growth.